New Japan Pro Wrestling had their annual puroresu extravaganza on 4th January, setting a benchmark for all the shows that will follow. Yes, every title changed hands on the show with some great matches and very few dull moments. Stiff suplexes, gravity-defying athleticism, engaging storytelling and jaw-dropping moments studded the biggest event in New Japan's yearly line up. With its eyes on the global stage, this was a very important show and it delivered on almost all categories. Chris Jericho battled Tetsuya Naito in a no disqualification match for the IWGP Intercontinental Championship, "The Rainmaker" Kazuchika Okada had a personal affair with the Switchblade and Gedo's new protege Jay White and the main event saw the IWGP Championship being contested between the Best Bout Machine Kenny Omega and New Japan Ace Hiroshi Tanahashi. So, here are 5 most memorable moments from the 13th edition of Wrestle Kingdom! Honourable Mentions- The echoing chants of the 40,000 strong Tokyo Dome for Juice Robinson, in an otherwise disappointing match, against Cody. The opening contest was between the Aerial Assasin Will Ospreay and the Golden Star Kota Ibushi. And boy did it live up to the expectations! 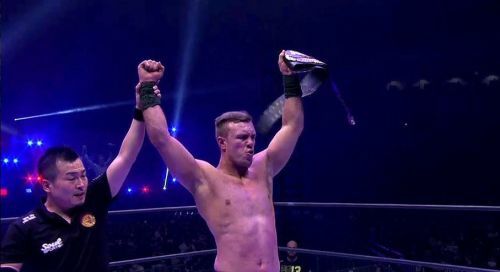 A quick paced match that was much more than impressive athleticism, the story of Ospreay admiring Kota Ibushi and building the match like a dream bout not only for the fans but Ospreay himself. Ibushi's moonsault being countered with a kick on the apron, a stiff elbow shot to Ibushi's head and the culminating Stormbreaker, the match was full of exhilarating moments. Even an unfortunate bump to the chin atop the ring post which seems to have legitimately injured Ibushi. Aside from that, the youngster overcoming his hero was a heartwarming tale to open the show!